John-117 teleporting via the teleportation grid. The teleportation grid, also referred to as a translocation grid, is a piece of Forerunner technology equipped to several important installations. Using slipspace translocation technology, the grid transports its users from one location to another in a compressed Slipstream field, not unlike starships using slipspace as a travel medium. The Halo installations are equipped with teleportation grids, allowing their Monitors to reach vital areas rapidly, and supervise their Sentinel charges. The Shield Worlds also possessed teleportation grids. While the teleportation system on Onyx was made up of a network of translocation platforms, the teleportation grids on the Halo installations allow translocation from any point on the ring without the need for a teleporter. Teleportation through a grid is typically accompanied by rings of golden light that surround the individual being teleported. A teleportation grid requires massive amounts of energy to operate. The translocation grids on the Halo installations are supported by an array of "telemetry clusters", spire-like structures equipped with synchronization conduits which ensure the grid's operation at all times. Teleportation grids extend some distance away from the installation they are based on, as evidenced by the Gravemind being able to use Installation 05's grid to translocate John-117 into High Charity, which was holding position near the installation. Translocation through a teleportation grid is not completely instantaneous; a sense of immense velocity could be felt when traveling through Installation 04's grid. Though the system merely transports its users through slipspace as opposed to disassembling and then rebuilding them in another location, the uncertainty errors involved are known to cause sensations of being put back together again "from a million pieces" when recovering from teleportation. In addition, the process typically causes feelings of nausea and disorientation on humans; Kurt-051 described the feeling as if "his guts had been untwisted, and then dumped back into his body, inside out." John-117 being teleported by 343 Guilty Spark on Installation 04. During the Skirmish on Installation 03 on July 26, 2557, 859 Static Carillon, the monitor of the Composer's Forge, temporarily disabled the Ur-Didact and used an emergency teleport feature present in Installation 03's teleportation grid to displace the Promethean commander into the Control Room. According to the monitor, the control center was the only destination available to him, being the most secure location on the ring. Static Carillon then teleported John-117 into the control room and, after ejecting the segment of the Halo housing the control room, he teleported the Master Chief aboard Blue Team's GA-TL1 Longsword in orbit just before the detached section impacted the Composer's Forge. Installation 04's teleportation grid was used extensively during the course of the Battle of Installation 04. The Installation's Monitor, 343 Guilty Spark, first encountered John-117 outside of a Flood containment facility, and used the teleportation grid to transport them to the Installation's Library, in order to retrieve the Activation Index. After the Index was retrieved, the Monitor used the grid again to transport the two of them to the Control Room to activate the Halo's final weapon. During the Master Chief's efforts to neutralize the Installation's primary firing sequence, Cortana tapped into the teleportation grid, using his Mark V MJOLNIR armor's fusion reactor to power a single jump, to a downed Covenant cruiser having learned how from when she was in the Installation's control systems; however, Cortana's relative inexperience with the grid resulted in reorientation difficulties: the Master Chief was teleported upside down. Installation 05's teleportation grid was unavailable during the Battle of Installation 05 as it was being controlled by the Gravemind (formed beneath that Installation's Library facility) through the Installation's captured Monitor, 2401 Penitent Tangent. Managing to ensnare both the Master Chief and the Arbiter, it formed a tentative alliance with the two enemies in order to stop the rings activation - teleporting the John-117 aboard High Charity, in orbit above the Installation, and the Arbiter near to the Control Room. The fact that it did not, or could not, use the same grid to teleport its own Flood combat forms to those locations indicates that use of it is restricted to non-Flood life forms and constructs. The artificial planet Onyx also possessed a teleportation grid, which was used by Dr. Catherine Halsey to transport the Spartan-IIs and IIIs across the megastructure during the Onyx Conflict. After translocating Spartans to safety from a Covenant attack in the map room, Halsey used it to an advantage when assisting the Spartan teams to disable a Sentinel manufacturing plant on Onyx, allowing the Spartans to rapidly traverse the immense facility. According to Dr. Halsey, an electromagnetic pulse generated by a nuclear weapon would have disrupted Onyx's teleportation grid for days, thus preventing the Spartans from using nukes to destroy the Sentinel factory. After the facility was destroyed, Halsey transported them to a room containing Team Katana's slipspace field pods and soon after, to the core room antechamber in the center of the megastructure. In the antechamber, the Spartans attempted to block Voro Nar 'Mantakree and his forces from entering by placing the pods on various teleporter platforms. However, there were too many to block in the antechamber and Voro's forces were able to teleport in using platforms further away. The Etran Harborage also contained a teleportation grid. On the Apex Site was a pad that could be activated through a voice command to transport its occupant to a desired location. In this pad's case, a ring rose up and surrounded the user with energy before disappearing, leaving the user at their desired destination. The Harborage also contained numerous small teleporters which acted similar to elevators, transporting anyone who entered them from a higher level to a nearby lower level and vice versa. Aside from aircraft, the main way onto the Apex Site was through a large pad teleporter at the top of a series of ramps that led to the Apex Base Site. This pad transported anything entering it to the Apex Site automatically. In order to escape Arbiter Ripa 'Moramee and his forces on the Apex Site, Professor Ellen Anders activated the teleporter there with a command of "surface!" The teleporter sent Anders to a small bridge on the surface of the inner shield world. Smaller teleporters were then used by Anders and Sergeant John Forge to reach an evac Pelican and to help move around while building firebases in the area. In order to destroy the shield world, Forge and his forces began moving the UNSC Spirit of Fire's Shaw-Fujikawa Translight Engine reactor up the ramps leading to the Apex Site teleporter pad. After fighting through massive Covenant forces, an M312 Elephant was able to back the reactor onto the pad, teleporting it to the Apex Site. Due to the Elephant being outside of the pad at the time, only the reactor itself was teleported. Requiem contained a unique teleporter in the form of portals that would open to various locations on the Shield World, including its surface and its core. Cortana was able to access and control the network after being put into a terminal and opened a portal to a tower in the planet's core so that she and the Master Chief could travel there to find the UNSC Infinity and escape the planet. 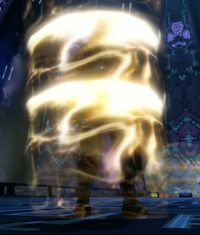 However, this awoke the Prometheans, who could also utilize the portal network to a great effect to move across Requiem. Cortana and the Master Chief later used portals to travel around the core and later to escape to the surface when the core started to collapse. After shutting down the particle cannons protecting the gravity well generator and meeting with a personality imprint of the Librarian, the two used a portal to rejoin the nearby human forces. The Forerunner ship Mantle's Approach possesed a teleportation grid in the form of portals similar to Requiem to allow beings to move about the ship easier. Once Cortana was inserted into the ship's systems, she was able to open portals to various locations throughout the ship before finally getting the Master Chief to where he wanted to go: the Composer. A Forerunner structure on one of Aktis IV's islands possessed a teleportation grid in the form of portals similar to Requiem. A Builder facility on Triniel possessed a teleportation grid in the form of translocation pads for easier transport around the installation. After the facility was reactivated by Rion Forge, 343 Guilty Spark was able to access the grid and use it to teleport the crew of the Ace of Spades to the level containing the lab with the slipspace flakes and then the level with the design seed lab. After they had succeeded in their mission, Spark used the grid to return them to the surface. A Forerunner site beneath Mount Kilimanjaro possessed a translocation pad that was used by 343 Guilty Spark to teleport the crew of the Ace of Spades to just below the summit of Mawenzi. An ONI science team that later examined it determined that the teleporter was a static portal going only to that one location. The effects accompanying teleportation through a grid are present in Halo 3 when a player flips inside a vehicle. It can be viewed easily in theater mode. In co-op mode, when one person enters a loading zone, but the other person is separated, the other person will teleport with the same animation as the Halo teleportation grid, even if the level is set on Earth. The teleportation grid in active use in Halo: Combat Evolved. View of the teleportation grid's rings in Halo: Combat Evolved. John appearing in High Charity because of the teleportation grid in Halo 2.